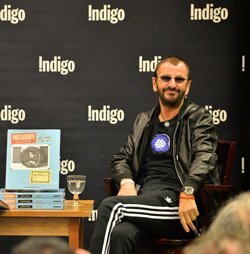 Ringo Starr entertained 250 readers in Toronto on Tuesday, where he spoke to Indigo Bookstore’s founder, Heather Reisman, about his Open Edition PHOTOGRAPH book and PHOTOGRAPH Portfolio 2015. Ringo also met with print collectors including Nick Angelo – a guitarist whose band, The Four Frenchmen, supported The Beatles at the Forum in Montreal in 1964. Nick presented Ringo with a photograph he had of the pair shaking hands during the show's interval, over 50 years ago.